Coach Aaron will be stepping down from Hammerheads to take on a more full time role with GVRD. His last day coaching with us will be Monday, April 29th. He will still be around the pool and will be sub coaching with us from time to time. College student and past VJO swimmer, Chris Toledo will be taking over Hammerheads 1 and 2 Groups June 1st. In the meantime, Coach Daniel will be stepping in to take Hammerheads until Chris gets back from college. Coach Sophie will be stepping down from coaching both Junior and Leopard Sharks groups to start up her own swim lesson program. Her last day with us will be Sunday, April 28th at the Napa Meet. You will still be seeing Coach Sophie around the pool and she will be staying with us as a sub coach. Coach Maureen will be taking over the Junior Group and Coach Jennifer will be taking over the Leopard Shark Group. We wish Coach Aaron and Coach Sophie the best of luck in their new adventures and look forward to seeing them around the pool. Thank you for all that you have done for our swimmers! Starting May 1st Coach Maureen will be taking over the Junior Group and the Mako Group. Coach Jennifer will be taking over the Leopard Shark Group. Coach Daniel will be taking over the Hammerhead 1 & 2 Groups. If your family has any questions about any of these coaching changes, please feel free to reach out to me or any of our coaching staff or board members. The following Swim Meet Information has been taken out of our "VJO Parent Handbook" and is good reminder to all our swimming families new and old. If you ever have questions about swim meets or other VJO information, please feel free to speak to your coach or any VJO board member. Coaches are on the pool deck 15 minutes prior to practice and 15 minutes after to answer your questions. If needed, you can also schedule a meeting with any of our coaches outside of practice time. • Arrive at Meet On Time – The meet arrival time will be specified by the VJO coaching staff. • Report to Check-in Table - Swimmers must report to the check-in table and check in for all events entered. If there are any problems during check-in or possible mistakes made with entry forms, discuss the matter with your coach, so corrective action can be taken immediately. • Check In with Your Coach – Make sure to check in with your coach, so they know you have arrived at the meet. If your coach is not present, check in with you specified meet coach. • VJO Coaching Staff will Oversee Warm-ups - A member of the Vallejo Aquatic Club coaching staff will oversee warm-ups. Parents are not allowed behind the blocks during warm-ups. Some meets may even have closed decks. • Mandatory to Wear Team Suit/Team Cap - It is mandatory for VJO swimmers to wear the team suit and team cap at all meets. All other team apparel is recommended; however, wearing the complete team uniform promotes team unity and greatly aids spectator recognition. • Know Your Events - All swimmers should know which events they are swimming before warm-ups and be present to swim each event. Most swimmers write their events, heats and lanes on their hand with a sharpie. • Sit in Team Area - All VJO swimmers need to be sitting in the designated VJO team area of the pool. This helps to prevent our swimmers from missing events and allows the VJO coaching staff to find swimmers if needed. • Check in With Your Coach Before Each Race - Prior to each event each swimmer must check in with their coach. • Getting Your Time - At most meets, electronic timing is used. The official time is generally the one recorded in the computer by the swimmer touching the wall and appearing on the scoreboard. • Check in With Your Coach After Each Race - At the conclusion of each race, the swimmer should ask the lane timers for their stopwatch time. The swimmer should then come IMMEDIATELY to the coaching staff. This gives the coaches an opportunity to discuss the race with each swimmer and add positive and constructive comments concerning splits, stroke technique, race strategy, etc. • Warm-up & Warm-down - Before and after races, swimmers should warm up and warm down in the designated warm-up/ warm- down area. Ask your coach for specifics. In between races, swimmers are also asked to rest and stay warm. All energy should be saved and used for competition. • Check Out With Coach Prior To Leaving Meet - It is very important that swimmers check with the coaching staff prior to leaving any meet. This makes certain that swimmers are not entered on a relay or in additional events. WHAT TO BRING TO SWIM MEETS? • When you wear the VJO team uniform, remember that your actions reflect on the entire team. 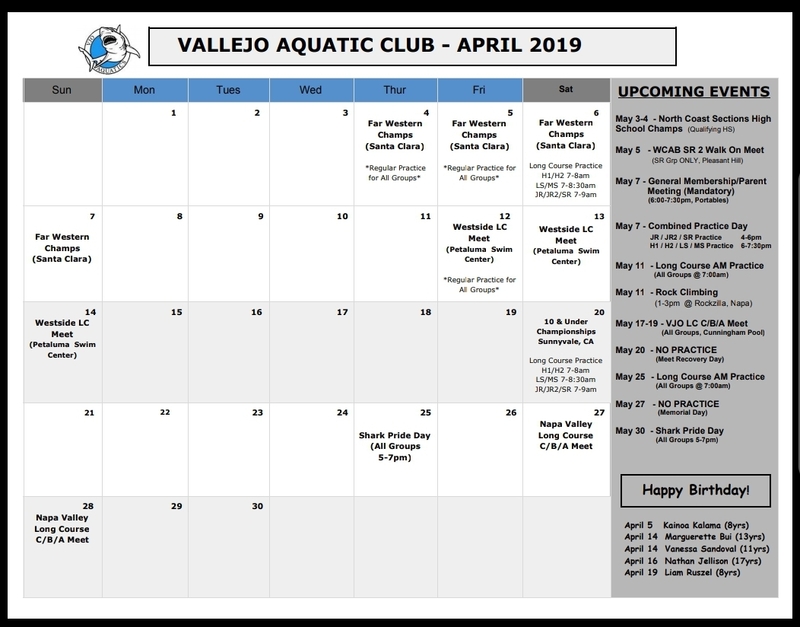 Let your actions reflect the pride you have in the Vallejo Aquatic Club! • For safety purposes, swimmers and parents should stay out of the competition area during a meet unless swimming or serving in an official capacity. Keeping off the deck is also a matter of courtesy to the swimmers, officials and meet host. We want to make sure swimmers can get to their events. • All questions swimmers and parents have regarding meet results, an officiating call, or the conduct of an individual, will be referred to the VJO coaching staff ONLY. The VJO coaching staff will pursue the matter through the proper channels. • As a matter of pride, VJO families should leave the team area and the pool in a neat and clean condition at the conclusion of each day of a meet. • VJO swimmers are never to scratch or “late enter” an event without consulting with their coach first. • After a swimmer is finished with his/her races for the day, they must notify a coach if they wish to leave the meet. You can order a team suit and other team gear at any time. Just take an order form down to Making Waves Swim Shop in Walnut Creek and place an order today. Make sure you try on a team suit first. Order forms for team suits, team parka's and team gear are attached below. Order Forms can also be found on our team website and at the pool. For team caps, see any of our VJO coaches (Latex- $5, Silicone - $12). On the following Saturdays we will be having long course practices. All groups are welcome to join us for these practices. We recommend joining us for these long course swims in order to help better prepare you for our upcoming long course meets. The Spring VJO General Membership Meeting (Parent Meeting) will be held on Tuesday May 7th from 6-7:30pm in the Portable Buildings next to the pool. Drinks and snacks will be provided. This meeting is mandatory for ALL PARENTS to attend. We will be discussing important items like team policies, budget and fundraising. A detailed agenda will be sent out before the meeting. There will be a combined practice on this day. There will be a special combined practice schedule on this day. The Junior, Junior2 and Senior Groups will swim from 4-6pm, before the General Membership Meeting. The Hammerhead 1, Hammerhead 2, Leopard and Mako Groups will swim from 6-7:30pm during the General Membership Meeting. 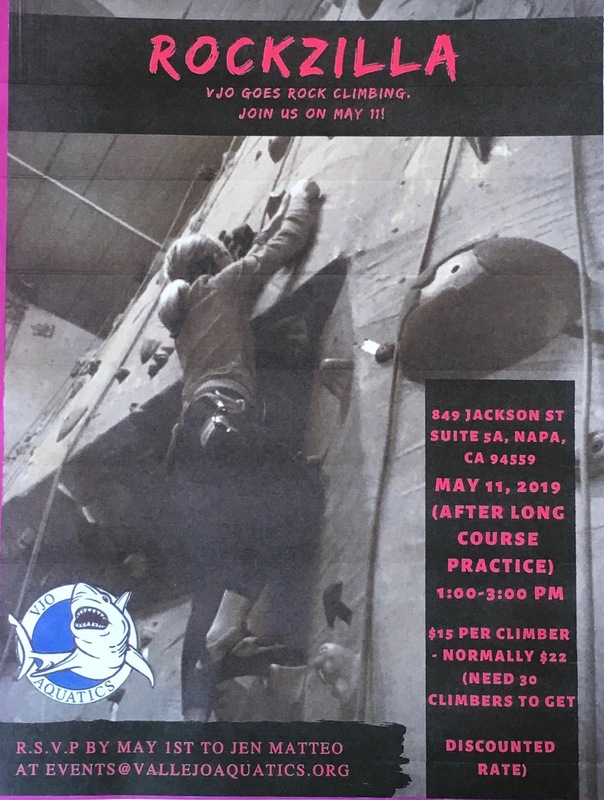 Join us on Saturday May 11th from 1-3pm for Rock Climbing at Rockzilla in Napa. Flyers have been placed in family file folders and extras can be found at the pool. The 10 & Under Championships Meet is CLOSED for entries. The meet will be held on Saturday, April 20th in Sunnyvale CA. This is a qualifying meet. All 10 & Unders most have achieved the qualifying time standard to enter. RELAYS: There will be relays at this meet. Our coaches have entered one 10 & Under girls relay and one 10& Under Boys relay. 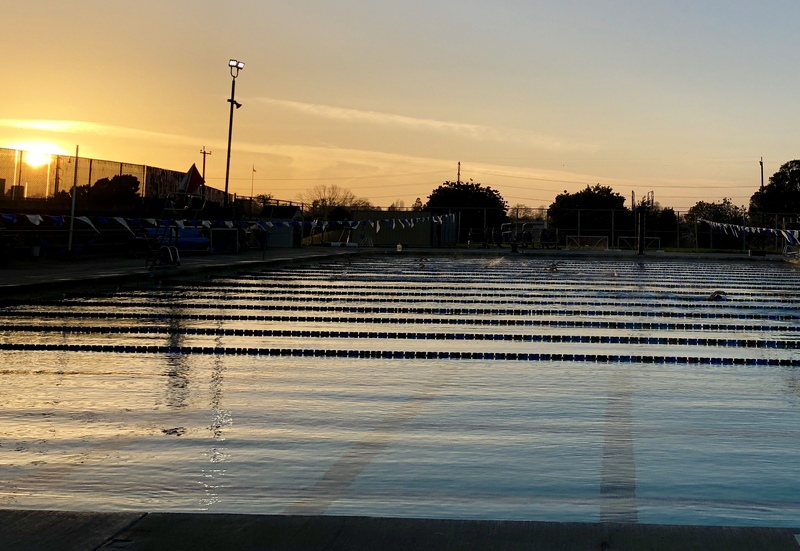 The Napa Valley Swim Team Long Course Meet is CLOSED for entries. The Napa Long Course Meet will be held on April 27-28th at the Napa Valley College Pool.